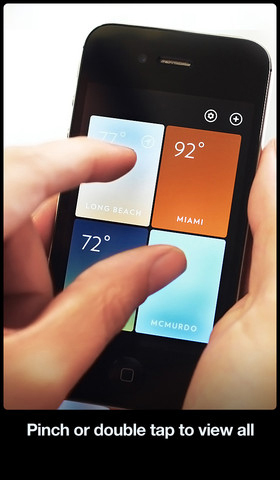 So yes, we've seen our share of weather apps on the iPhone. They're all apps that display either too little information or are complex loads of information that only a meteorologist would appreciate. But not Solar. This iPhone weather app will incorporate all the necessary weather information you might be actually interested in knowing into one attractive and minimal design. It doesn't try to hide information under some sort of options. Rather, through a sleek and useful UI, you have more information that you would expect after opening the app. Solar will display by default the current time, the local temperature and location and a description of the current weather conditions. All this on a sifting abstract background that intuitively uses colors and animations to visually give you an idea of the outside weather and time of day. For example, if the temperature is in the high 90s and it's day time, a bright combination of orange and red will fill your screen. If it's night time, the screen will likely be dark with green accents. If it's raining outside, Solar will display rain falling from the top of your screen. If you tilt your iPhone, rain drops will shift in that direction as well. Thunderstorm? No problem. Solar will flash the screen to show that as well. All in all, the most extreme weather conditions can be easily portrayed using simple color combinations and various animations. If the default screen Solar shows you might lead you to believe that's all, you couldn't be more wrong. Solar won't display any buttons for you, but if you paid attention in the introductory tutorial, you have a multitude of additional information literally at your finger tips. 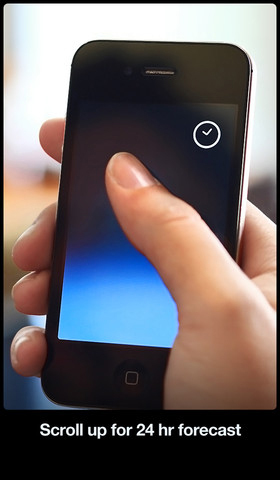 From the main screen, you can swipe in all four directions, pinch or double tap, and each action will get you more information. 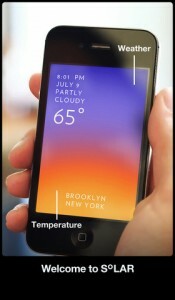 Swiping left and right will reveal additional screens with weather information on other saved locations. By default, your current location is shown on the main screen. Swiping down will show you a simple forecast for the next three days. If you double-tap or ping, Solar will zoom away to a screen where all the saved locations are laid out like poker cards. Take a good look in the top right, as those are the only two buttons you'll see throughout the app. One is the settings that will give you some options like setting the units to either Celsius or Fahrenheit. The plus button will let you add another location. You can also swipe right past the last saved location and you'll be prompted to add another location. Gestures all the way! Swiping upwards is where Solar shines. As you gradually swipe upwards, you can time-travel and Solar will shift the weather screen to that point in the next 24 hours, complete with colors, animations, temperature and feels-like information. Once you release, the clock turns back to the present and, with it, everything about the weather. Tap once on the screen and you'll hide everything but the colors and animations. You can still swipe up, down, left or right. 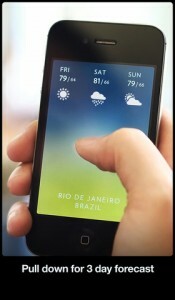 Most of us will think that having to open a weather app to see the weather is so passé. There's notification center with a simple pull down from the top of the screen in virtually any app on the iPhone. But you're missing the point. That weather widget is a shortcut, it's not beautiful, it's not sleek, nothing artistic, just one bit of useful information: the outside temperature. With Solar, you get tons more and what is the iPhone if no one opens any apps on it? The only way I'll drop Solar is if Apple uses this exact app as the homescreen lock. I'm talking everything from color usage and animations to show outside temperature and current weather conditions to swiping upwards to reveal a forecast for the upcoming hours. What do you think of Solar? Scroll down for our comment section and let us know!